Always look both ways before crossing the street! Aviation Laboratories' MP (Maintenance Products) Group, are experts in everything maintenance! From filters and gaskets to lubricants and cleaners, you can count on this team of professionals to offer reliable solutions for your maintenance needs. Linda contributes 16 years of experience in the Aviation industry. Linda’s zeal and passion for her work allows her to keenly adapt to the dynamic challenges of the ever changing industry. Linda undeniably enjoys her work, making it possible for her to deliver the best possible service to each client with integrity, compassion and attention to detail. I am a new addition to the Aviation laboratories team. I am very happy to part of the Avlab family. I strive to provide excellent customer service to each and every one of my customers and am here to assist with your laboratory or maintenance needs. As a native of New Mexico I enjoy the fishing and camping and spending time with my 4 children. 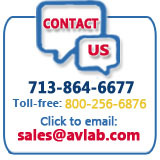 Andera has been with Team Avlab since the beginning of January 2008. Being a people person she has a natural ability to communicate and understand customer’s needs to ensure satisfaction with just about any issue that may arise. When Andera isn’t enjoying the company of her Avlab family she is doing what she loves most; encouraging and uplifting others, singing at church, spending quality time with the love of her life (her son), and being surrounded with family/friends. As a new member of the Aviation Laboratories Team, Fran can personally commit to you Customer Service Excellence! While this has always been a priority for him, he feels that honesty and integrity are equally important. This former Colorado Firefighter enjoys family time with his wife and their twin daughters as they settle in as new Texas residents. He is looking forward to working with you!